Cincinnati, Ohio is a medium-sized city located on the state border with Kentucky. In the past, it was considered the first American boomtown and most American city. It is also home to some major sports teams. Most of the dog-friendly activities around Cincinnati involve parks, so it is best to go when the weather is pleasant. The Kellogg Dog Field is about 5.5 acres in size, and has been open since 2004. There is one area for large dogs and one for small dogs. It is enclosed by an 8 foot wall, and there are lots of trees for shade and fields to run around. There is water available at a nearby restroom. It is open daily from dusk to dawn. This dog park is about 2 acres in size, and dogs may run around within the fenced area. Dogs must be leashed when they are in the remainder of the Mt Airy Forest. 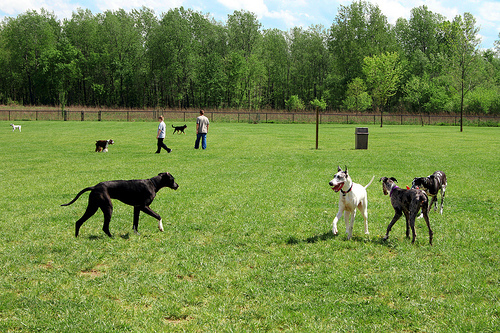 This is a 10-acre dog park with separate large and small dog areas. Pit bulls are forbidden from this park. This park is located in Central Cincinnati, and and is full of sculptures, a gazebo, old trees, a playground and walkways. Dogs may go here on leash. 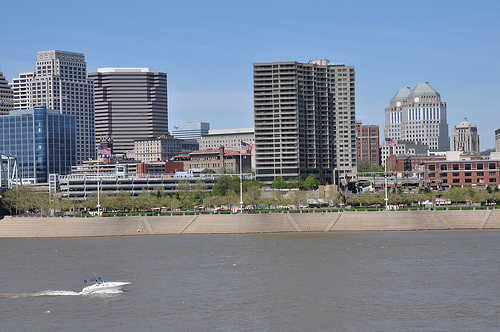 Lytle Park is a 2.3 acre park that is situated in Cincinnati central business district. It features many flower gardens and public art. There are also restrooms. Dogs may join you on leash. French Park is located in the eastern part of the city, in Amberley Village, and features over 250 acres. There are hiking trails, wooded hillsides, creeks and fields and some nice views of the city. Dogs may go on the grounds on leash but not in any of the buildings. This cafe serves coffee, along with foods like pastries, sandwiches, waffles and more. Leashed dogs can join you at the outdoor tables. Indigo is a “casual gourmet cafe” that serves assorted Italian food like pizza, pasta, Stromboli and soups. Dogs on leash may join you at outdoor tables. Molly Malones is an Irish pub that has some Irish and American options. Leashed dogs can sit with you at outdoor tables.